What’s good about storing files on Dropbox if you can’t share them? Sharing files and folders is a great way to collaborate with friends and colleagues on projects without having to e-mail back and forth. All you have to do is grant access for others to view and download files from your Dropbox. Place your cursor over the file or folder you want to share and right-click. 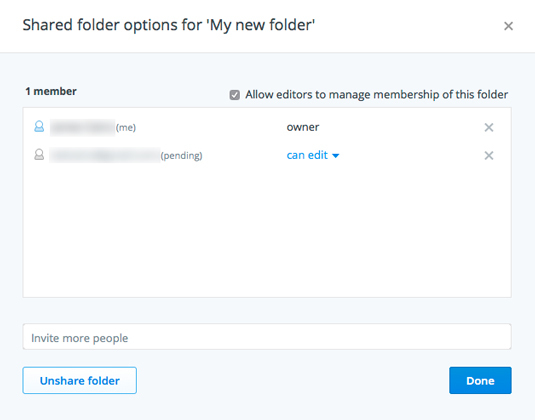 Invite People to Collaborate: This option enables you to share the folder with other Dropbox members and assign permissions. Note that the basic Dropbox service allows only Edit permissions. To assign view-only permissions, you have to upgrade your plan. Send Link: This option does the same thing as sharing a file, so continue to follow the steps below. In the Share dialogue box, type in the e-mail address of the person you want to share with (see Figure 1). In the Message field, type in an optional message. And that’s it. 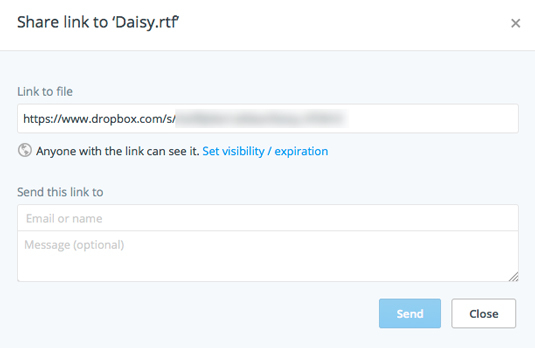 Dropbox sends an e-mail to the person you specified containing a link to the file. You’ll also receive notification of when others view your files and folders. Figure 1: Share a file with Dropbox. You can also copy and paste the provided URL into an e-mail message, if you’d rather use your regular e-mail program to send the message. You can’t password-protect or set an expiration date for the download with just the basic (that is, free) Dropbox service. To be able to do those things, you have to upgrade to Dropbox Pro ($10 per month) or Dropbox for Business ($15 per month). So, if you click the Set Visibility/Expiration link, you won’t be able to modify those settings without a Pro or Business account. When you use the Invite People to Collaborate option when sharing a folder, you can manage the folders you’ve shared by clicking the Sharing option in the left navigation of your Dropbox. You see a list of the folders you’ve shared. If you click on the New Shared Folder, you can do one of two things. You can create a new folder to share or share an existing folder. These are the same as creating and sharing folders elsewhere, so you should know how to do this. If you have a Pro or Business Dropbox account, you can change permissions to View Only in the drop-down menu next to the member name. Click the X to remove a member’s rights to the folder. In the Invite More People field, type in additional members to share the folder with. You can assign permissions and type in an optional message that Dropbox will send. Click the Unshare Folder button to remove access to the folder by everyone but you. Figure 2: Manage shared folder options.